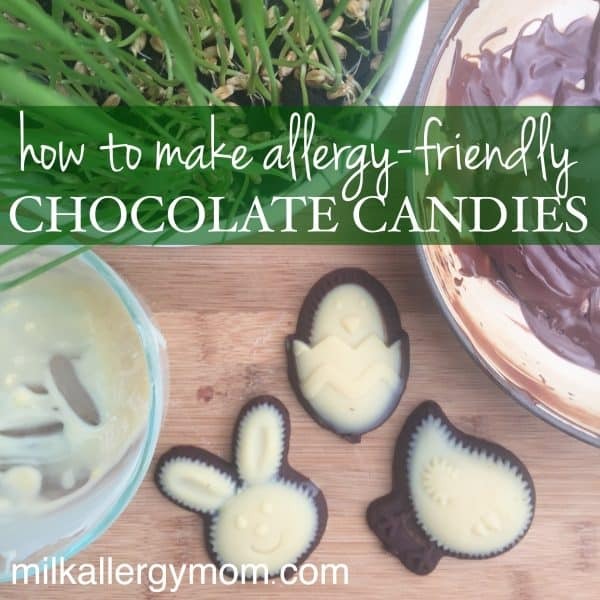 For years, I have been molding my own dairy-free and allergy-friendly chocolate suckers and candies for my kids’ Easter baskets. Then one year, as they were getting older, I decided to splurge on store-bought dairy-free chocolate bunnies at about $15 each. I thought my boys would be ecstatic to get their first-ever chocolate bunnies not made by mom. But guess what? They told me they missed my DIY chocolate Easter suckers. Funny boy story, they weren’t particularly keen on store-bought bunnies being hollow. Mom’s chocolate are solid, baby! I keep wanting to upgrade from suckers to this 5″ bunny (affiliate). Should I go for it?! Now here’s how to impress your kids with solid chocolate candies, suckers, and even big bunnies for Easter. It’s not hard, but it takes some precise steps. And yes, you will save money by making these yourself! Use allergy-free Enjoy Life chocolate chips or Pascha white chocolate and candy molds of your choice. If you are making suckers, you also need sticks. You may want candy bags, as well, for packaging. Or use baggies or foil to wrap your chocolate candies airtight. Wash new molds with hot soap and water. Make sure they are completely dry before starting. Any water getting into the chocolate will ruin the smooth chocolate texture. After washing and drying the molds well, melt half the bag of chips in the microwave along with 1/4 teaspoon of coconut oil in a bowl. If you can’t do coconut, you can skip it. It’s not necessary. It just thins the chocolate a bit. Stir the chips every 30 seconds until they are mostly melted. Then stir the rest of the way until melting is complete. Don’t overheat the chocolate, the chips will scorch. That’s why I stop heating when they get close to smooth. After melting the chocolate, fill the mold using a spoonful at a time. Once filled, gently tap the mold on the counter until the chocolate levels out. Make sure each mold is filled to the top. If you are doing suckers, put a stick in each chocolate where the mold allows for sticks. Make sure each stick reaches to the top of the image so they will hold. Then gently twist each stick until the chocolate covers the sticks completely. Place the chocolate filled mold in the freezer to set. It doesn’t take long! Before removing the candies from the mold, make sure they are completely frozen by checking the front images. You will be able to tell if they are set by if the chocolate has pulled away from the plastic or not. After removing the candies from the mold, store them in airtight packaging. Store in the freezer just to make sure your hard work does not melt before “show time”. One bag of Enjoy Life chips yields about 7 large suckers with a little extra. One bag of chocolate would make many more small candies, and possibly one chocolate Easter bunny depending on the size. Hope this helps. 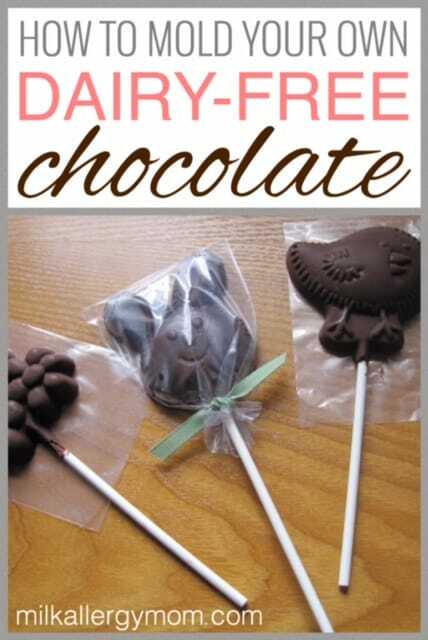 Have fun molding your own dairy-free chocolate candies! What a great blog- I just found it today. I am a mom of two kids (3 1/2 and 2) with food allergies (milk, eggs, peanuts, almonds and cashews) and a two month old with suspected milk allergies. You mentioned you purchased Enjoy Life chocolate bars at Meijer. I shop there and have never seen them- where in the store have you found them? Thanks! We love Enjoy Life and for the first time I made the chocolate pops and I also found a mold for 2 large bunnies at acmoore….thank you for helping me make this Easter so special for our little one. Jamie, LOVE this idea. I bought molds last week so I could make my own chocolates this year, but didn't even think about adding the candy stick to it. Awesome! I'm going to share w/ my FB page and Twitter peeps. Thanks, Dawn! Have fun creating! And thanks so much for sharing. We appreciate it. Does the Enjoy Life chocolate contain a lot of sugar? It’s pretty “normal”. Yes, sugar. Hope that helps! Do you ever grease the molds with coconut oil? I tried to make turtles using the same ingredients you did and mine wouldn’t come out of the plastic molds! Any hints?